Back to original owner! Home sweet home…. I picked up this bike a few years back from a good friend who just didn’t ride it anymore. 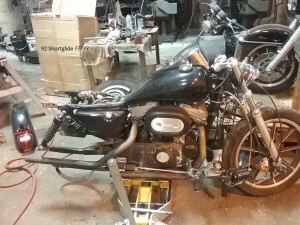 We cleaned it up and blacked out most of it, added the solo seat, put some decent baffles in the drag pipes, cut down the air filter housing, and put a kit in the stock CV carb. It really woke the thing up and those 1200’s really run. 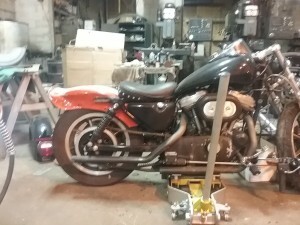 We sold the bike and the guy added the apes, forward controls, and stretched tank. We just took it back in on trade and it needs a little TLC. 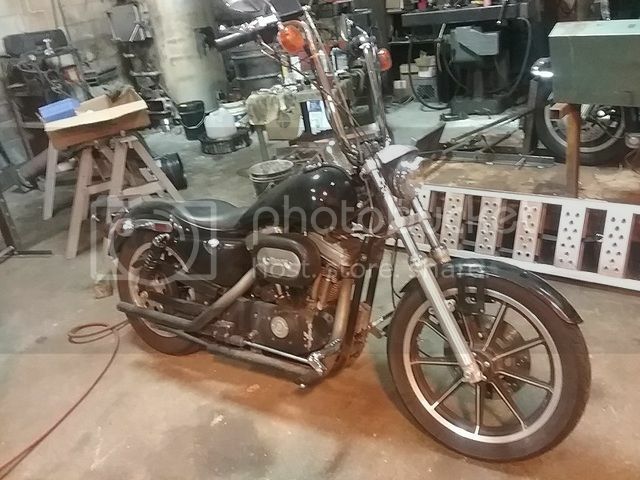 If the bike hangs around a while I’ll pull the apes and make it back into a real sporty…..
Got a cool set of bars I’m going to mount on this and then see which direction it goes. Got the back tire off to clean it up and decided to change out the back tin to match the tank and the bars. Here we go again……. It’s almost in the right spot so once that gets done then we’ll match the inner radius to match the tire and get it prepped up for paint. 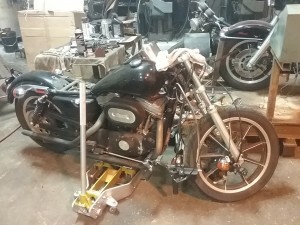 Mocked up fender and beach bars….. Modified the fender struts and they don’t look too bad so now to finish getting the fender prepped up for paint. The forward controls have the stretch kit so I’m going to take that off to shorten up the leg room a bit. The feel is pretty good with the bars and seat. Got another tweak I might do so I’ll mock that up and see if I want to go that direction.